Foliage nearly or quite smooth; rootstocks slender, branching, or the plants growing in matted clusters. Early leaves narrowly ovate and heart-shaped, more or less "long pointed toward the apex, the margins crenate-serrate; petioles slender and smooth. 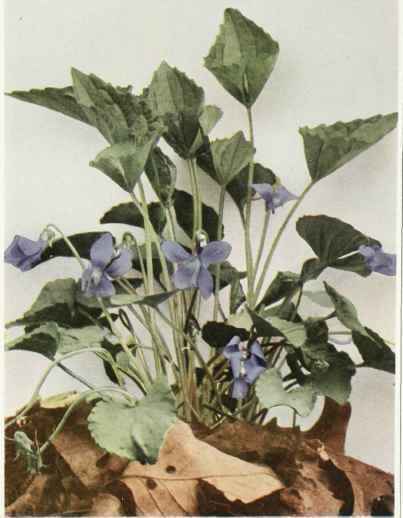 Flowers violet with a conspicuous white center; the cleistogamous flowers small, on ascending stalks. Common in moist meadows, low woodlands and shady borders of streams, New England to Wisconsin, south to Georgia and Alabama. Flowering from April until June. The mature leaves of midsummer are about 2 inches wide. The Northern Bog Violet (Viola nephrophylla Greene) resembles LeConte's Violet in some respects, but the leaves are broader and more blunt. It occurs in cold, mossy bogs and sometimes along borders of streams and lakes from Quebec to British Columbia south to Connecticut and Wisconsin. It appears to be abundant in a bog in Bergen swamp, Genesee county.